This guide will explain how to make a super payment with Microkeeper and SuperChoice. Select the Period you will be processing Super payments for. This can be any period whether you pay Quarterly or Monthly. Select the Super via Fund Report. From the drop down list select HTML. This will give us a summary of which funds and employees we are about to make contributions to. If there are any missing or incorrect details a red box will appear on the left. These will have to be fixed before you can proceed. In the below example, Joel does not have a Super Fund selected. You can click on the name in the red box and amend the missing super fund. The employee can also amend these details from their employee console. Once the details are complete, you can complete processing. If all your employees Super Details are complete, you are ready to make payment. Confirm the amount to be paid, confirm you have reviewed the report and click Pay Super to make the super payment. This data has now been sent to SuperChoice, they will debit your bank account and make sure the contributions go the correct funds. A payment can take 1-3 business days to be deducted from your account. Once cleared the payment will take about 5 business days to be processed. 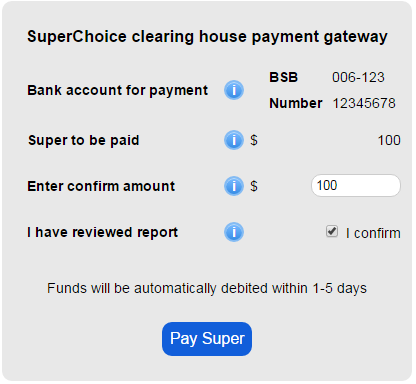 In SuperChoice you can see how a payment is progressing and if it was successfully distributed amongst the funds. If you have any concerns Microkeeper is happy to walk you through this process.